A wrench in the works for my project of listening to compact discs, one at a time, all the way through, touching at least once on every band or artist in my collection: I bought a new turntable for the basement listening lounge! I have been distracted this week by vinyl and paused my project to bip around in the alphabet with the LP record: Here Comes Everybody, The Bird and the Bee, Eels, and Other Lives. Okay, no more screwing around. Back to the C compact disc grind. Not a grind. Pure joy, actually. In my rush to get to Elvis Costello I accidentally skipped a C artist, and, disappointingly, have discovered the first truly BAD record in my compact disc collection. Julian Cope’s “Peggy Suicide” is definitely one for the hopper. This guy can’t sing and he can’t write a song. His appeal seems to come, perhaps, from his politics maybe, his new wave cred, his striking good looks (at least in 1990), and his experimental, mystical, artsy bent. There may be a few interesting moments, but overall, it’s not good. And vaguely remembering this appraisal from my last listen 26 years ago, I groan out loud as soon as the display tells me this baby is 76 minutes long. God no. Make it stop. Counting Crows, “August and Everything After.” Another pirate. Someone must have been trying to turn me on to this band. They went so far as to print a facsimile of the album cover to slide into the jewel case for the cdr. I like the hippy dippy grooviness and the musicianship, but I find these guys terribly boring. I don’t see it. Another one into the hopper. Jim Croce, “Photographs and Memories: His Greatest Hits.” Yes. This is in my collection. I don’t know why. I may have stolen this CD from my parents’ music library. I know I would not have bought it. But it was before my time and after theirs; if my parents bought it, it was out of some vague sense that, yeah, here’s this guy, we know a couple of these really nice songs, should probably have it. No doubt, there are classics here, and that probably, more than anything else, explains its presence in my house, however it arrived here. I’ve got some serious childhood sentimentality around some of these tunes. “Time in a Bottle.” “Operator.” “I Got A Name.” Hell yeah. And “Bad, Bad Leroy Brown.” Any early 70’s childhood experienced even in the least degree with music would have been unable to escape Jim Croce. Sheryl Crow, “Tuesday Night Music Club.” I remember the video for “All I Want to Do” and I remember thinking that Sheryl Crow was perhaps the most beautiful woman I had ever seen. I remember, too, at the time of its release, not being quite smitten enough to buy the album, and that I didn’t really think much more about Sheryl Crow until I realized that Kevin Gilbert played on this album and wrote some of these songs. So years later I found this cd in the used bin and felt I had to have it, for Gilbert’s sake, really. More on this later when we get to the G’s. There’s no doubting Crow’s talent. But except for a few tunes on this disc that are really pretty spectacular, it’s not for me an especially captivating record. The Cure, “Kiss Me, Kiss Me, Kiss Me.” What a great band. What a great lead singer, one of what I like to call the greatest worst singers in rock. He’s imprecise, whiny, sometimes operatic, but always 100% in. Emo? Okay, yeah, this guy might be the king of that kind of thing. I forgot how cool they were. How they were not afraid to drone on a thing for three and a half minutes in order to create a vibe, how inventive the drum parts were, how unattached to two and four, but how, when it was necessary, like in “Just Like Heaven,” it could be absolutely square in service of the perfect pop tune. Here’s a record whose seventy some minute running time is forgivable, not because every single thing is perfect and nothing is superfluous, but because their ability to change up the vibe from song to song and to create interest sonically in a six minute tune with no chorus to speak of earns them the right to stretch. One of the best of the last of the great 80’s bands. I’m sad I never saw them perform. Curiosity Killed The Cat, “Keep Your Distance.” My wife is heading to bed early so my nine year old and I go downstairs to listen to music together. He encourages me to carry on where I left off in the letter C. This is our first joint listening venture since I embarked on this project. He’s aware of it, but up to this evening has not been a participant. What a fortuitous time to begin. This obscure band from England put this record out in 1987–a hugely important time in my own musical history, my wife and I, as Here Comes Everybody, having written our first “good” songs and made our first professional recordings. And I was reaching out to find as much cool new music as I could find. This record here is a kind of funky new wave dance record, reminiscent of the first record from The Blow Monkeys but with more muscle and a decidedly less nerdy vocal croon. The opening track is “Misfits,” and my son and I find ourselves dancing together in the basement. He’s busting out moves I’ve never seen him make before and it’s glorious. This record holds up, is musical, tight, and, as of this evening, approved by a nine year old boy. We have time for one more record before we go to bed, and it’s another gem, for some reason incorrectly alphabetized after Croce, Crow, Cure, Curiosity and not before: Crash Test Dummies, “God Shuffled His Feet.” Produced by Jerry Harrison, formerly of Talking Heads, and released in 1993, this great record rocked my world just as the David Byrne solo record I wrote about earlier did. It was a time of incredible personal and artistic growth for me. I remember listening to this record over and over again at the Breadloaf Writer’s Conference, where I would realize that my pursuit of a writing vocation was no longer negotiable, and where I learned about the MFA program at Warren Wilson. Life changing stuff. And this band, a writer’s band, lead singer Brad Roberts having graduated with a double philosophy/English degree, absolutely floated my boat. I don’t think I know of a single band fronted by a singer who goes this low–not a typical pop music thing. And they captured an absurdist bent that mirrored my own–I was after all, beginning work on the first novel I would ever write, a novel, appropriately enough, about spontaneous human combustion. 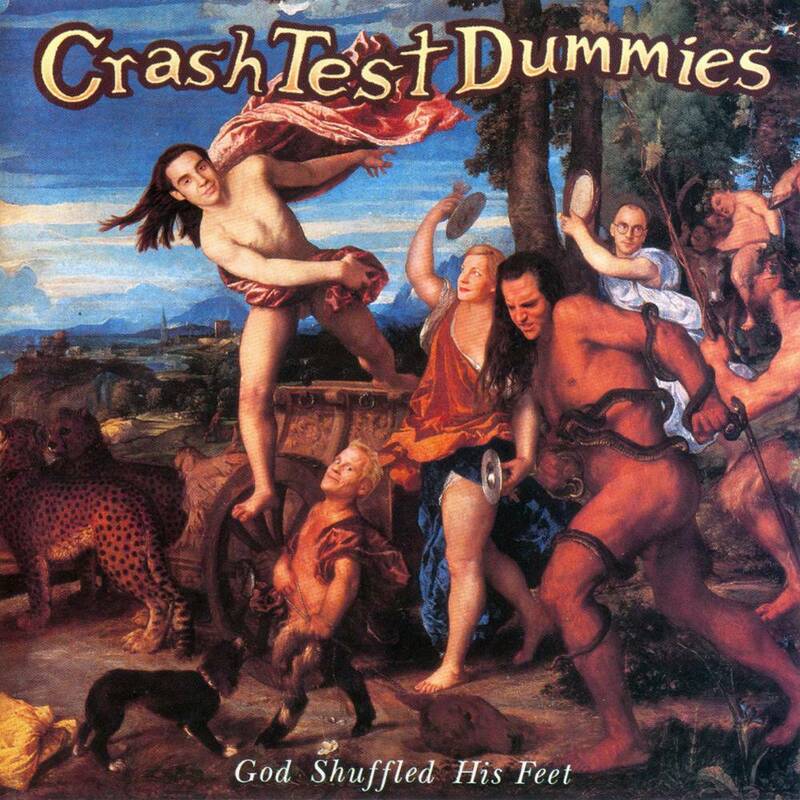 It fit right into the world of The Crash Test Dummies. Here’s this thing, not anywhere close to the best song on the record, but it was, after all, the hit. Remember? The nine year old is amused. Jesus, I realize again that my alphabetizing is totally messed up. Must be that during the move four years ago, compact discs were put in boxes in a particular order and then came out of those boxes sometimes in a different order. Either that, or I don’t know how to alphabetize. That’s not likely, as I am, obviously, correcting the mistakes. Somewhere between Counting and Crow if correctly alphabetized, a band that brings up the rear of my C section in its current f-ed up order, a band for whom I should not limit myself to just one album because they were and are a truly great band and I think I have every studio record they ever released, is New Zealand’s Crowded House. The pedigree of this band, as it is, spread between three other artists in my collection, Split Enz, Neil Finn, and Tim Finn, provides me with the inclination to choose just one–the only Crowded House record to feature the brothers Finn, an indisputable great album: “Woodface.” A celebratory record. 1991. The Finn brothers together again. I was gainfully employed. Felt like an adult. Some rocking good years, the next decade maybe the best decade ever thus far. And this album, not a clunker in the bunch, a perfect pop masterpiece to ring in the last 10 years of a dying century and to end, albeit incorrectly, my collection of artists and bands that begin with the letter C.